@sukhforchange Thanks for choosing Canada and to contributing to a great Canadian tradition. Like an every newcomer to Canada and a recent graduate I was looking for a job. I wanted to thank you for coming in and presenting on the Engineering Connections Bridging Program. We have had such positive feedback following your talk. We thoroughly enjoyed your motivational presentation and hopefully participants have learned a lot from it! two offers to select the best one from them. This achievement is ONLY because of YOU! Life is a long learning…You have the immense ability to inspire others in helping them carve the path to success, by sharing with them your knowledge and providing them useful guidance. Wish you the best in all your pursuits!!! My meeting with Sukhjit Singh was an unforgettable incident. It had been a few months in Canada as a landed immigrant. Upon landing I was experiencing cultural shock. In a new life, a new start, with two little girls. I was told by a friend to visit North York Library for a talk with immigrants. I saw a man in a yellow turban whom introduced himself and then told us his story and his experiences in Canada as an immigrant. I felt as though he was talking about my experiences and feelings. Then he showed us a magazine and I immediately remember it. 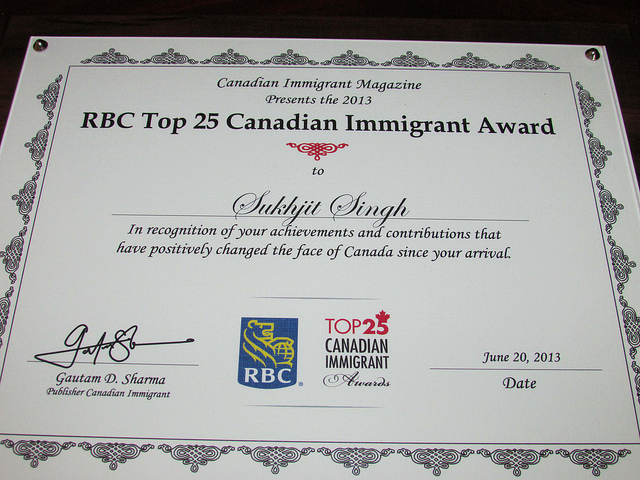 We were given that magazine on the first day of landing TOP 25 IMMIGRANTS OF CANADA , and at that point I had thought one day maybe I could be one of those Top 25 immigrants. I feel Sukjit singh is a selfless person who made a difference and is helping new immigrants with religion or creed and till today he guides me for my first job any query .I take him as an angel who came in my life only to help and guide me . I had a pleasure of attending Sukhjit’s keynote presentation on Volunteer Information Session in Mississauga last September, and I felt great to have got that opportunity. He was so live and bold in sharing his stories with us and getting his ideas across. When he was speaking that, “people are people no matter where they are from and what they do; we are not dealing with aliens,” one could feel that he was directly speaking from his heart to the audience’s hearts. He is an audacious motivator with a power to ignite people to the best. Sukhjit is a great personality who is always committed to help people. My first meeting with him was in one of the community workshop and in the very first meeting I got attracted to his positive aura. That time I was looking for a mentor to for successful career. Without hesitation, he promptly accepted my request and extended all kinds of help in my job search. I am extremely thankful that he took out his precious time from his busy schedule and groomed us (me and my wife). In our initial struggle days in Canada, he offered other supports at family level as well.